Family will greet friends starting at 10:00 a.m.
Anna Mae Hamilton, age 82 of Traverse City, died February 18, 2018. 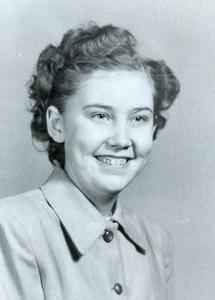 She was born on October 1, 1935 in Whitewater Twp. to Warren and Marie (Hogeland) Hamilton. The family moved to Grand Rapids when she was a small child. She graduated from Catholic Central High School. Anna Mae had a strong faith and in her twenties made temporary vows to the Third Order of the St. Dominic of Our Lady of Sacred Heart Order at Marywood in Grand Rapids. In 1964, she chose to leave the order and pursue her devotion as a lay person. Anna Mae studied accounting at Aquinas College and held a career in bookkeeping that included decade or more long stints at Godwin Heights Public Schools in Wyoming, MI and Crystal Flash Petroleum in Grand Rapids. She retired in 2002. Anna Mae was dedicated to her daughter and grandchildren. She was compassionate, hard working and never failed to help friends or family in need. She was a member of St. Alphonsus Catholic Church in Grand Rapids. After moving to Traverse City in 2010, she became a member of Immaculate Conception Catholic Church. Anna Mae is survived by her daughter, Elizabeth Hamilton (Todd Springer) of Traverse City, sister; Marjorie Larson of Grand Haven, grandchildren; Grayson and Celia Springer. She was preceded in death by her parents, and siblings; Lawrence Hamilton, Donald Hamilton, Dorothy Hamlam, Leonard Hamilton, Bernard Hamilton and Cecelia Otterbein. A Memorial Mass will be held 11am, Saturday, March 10, 2018 at the Immaculate Conception Catholic Church; where the family will greet friends starting at 10am. Memorial Contributions may be made to Catholic Human Services. Please visit www.lifestorytc.com to share your thoughts and memories with the family. The family chose Life Story Funeral Home, Traverse City.